One Design boats must hold valid class measurement certificates for their fleet and be a member of a recognized yacht club. Racing Windward Leeward courses within Chester Harbour. The history of the Bluenose Class sloop begins in 1946 when naval architect William J. Roué designed the wooden one design. These days modifications and improvements in construction over the years reflects the needs of an evolving race fleet – dedicated to rightly maintain the one-design features of the Roué-designed Bluenose Class Sloop. Helly Hansen Chester Race Week 2019 would like to invite boats to come and sail at a great keelboat Race Week, raced in one of the most beautiful places in the world! There is a Fleet for everyone at this race week including some serious one-design fleet racing and over 10 fleets of PHRF Handicap racing, and a Classics Pursuit Race. Marine Services in the region offer an opportunity for boats coming from other provinces and the USA by road to launch and haul, rig and store their trailers for a very reasonable rate. Visit our information page about accommodation and marine services on Chester Race Week’s Moorage page. Windward Leeward only, each fleet has its own start. There has to be a minimum of five boats for a fleet to race on this course. The Farr 30 was to create a state-of-the-art offshore one-design that would be fast and exciting, yet uncomplicated and economical. Designed in 1979, the Sonar is a fantastic racing boat of the new millennium and its rapid growth and ISAF Recognized status assures its longevity and value for many years to come. The International J/24 is undeniably the most popular racing keelboat in the world, with over 5400 boats being sailed. Since its introduction in March 2012, the J/70 has quickly established itself worldwide with 900+ boats sailing in 20+ countries in 2015. Racers on this course race some windward leeward races and some distance races. The C&C 99 is an American sailboat that was designed by Tim Jackett and entered production in 2002. Visit the C&C 99 Class Association. The J/105 was the first sprit boat when it was designed by Rod Johnstone in 1990. The J/105 is unsurpassed if you are looking for strong one-design competition either in your local area, or if you are able to travel to away regattas. Monohull handicap boats must have a valid Sail Nova Scotia PHRF Handicap and be a members of a recognized yacht club. Visiting boats may have their existing handicap (e.g. PHRF) converted using accepted formulas by the Sail Nova Scotia Handicap Committee Representative. 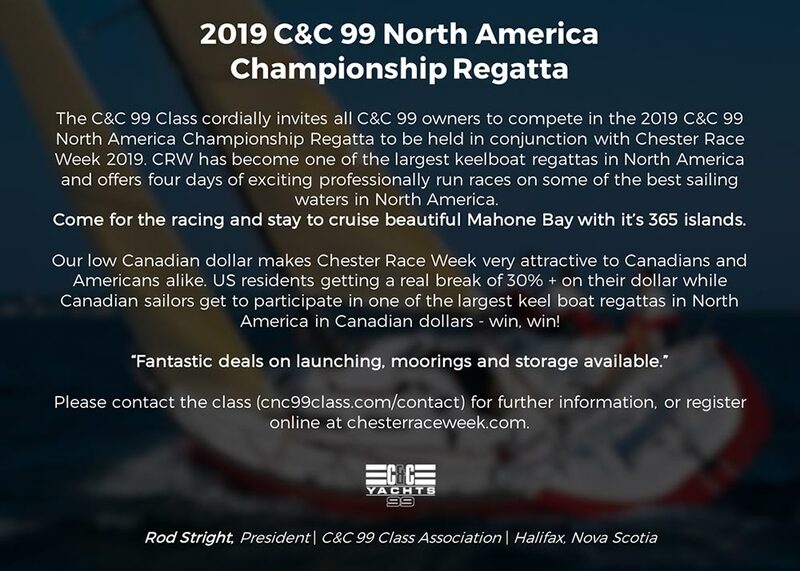 Those visiting boats are asked to contact Kim Johnson- cycmanager@chesteryachtclub.ca – by August 5, 2019 to arrange such a conversion. A boat wishing to register for the Classic Yacht Class must be a Classic Yacht as defined herein. A Classic Yacht is a Yacht launched prior to Dec.31 1969 or a replica of a classic or a boat that independently of her launch date was built in conformity with the design of a classic boat launched before December 31 1969. For more information visit the Chester Classics site. Inshore Racing Course will sail up to 2 races per day. The course length will depend on the conditions of the day. Some may be Windward Leeward Courses. Within the PHRF-NS Inshore Racing Course, the Race Committee will set the handicap split for each fleet and post them on the Official Notice Board no later than August 12, 2019. Distance Racing Course will sail up to 2 races per day. The course length will depend on the conditions of the day. The PHRF-NS Distance Racing Course will be sailed around fixed / inflatable marks. The PHRF-NS Distance Racing Course is open to PHRF-NS boats carrying a spinnaker and to PHRF-NS handicap boats electing to race using their PHRF-NS Non-Spinnaker Rating. PHRF-NS Total or PHRF-NS Non-Spinnaker Handicap must be declared no later than August 11, 2019 and cannot be changed for the entirety of the regatta. Boats which fail to declare their intention to race using their PHRF-NS Non-Spinnaker Handicap by the deadline will be scored using their PHRF-NS Total Handicap. Within the PHRF-NS Distance Racing Course, the Race Committee will set the handicap split for each fleet and post them on the Official Notice Board no later than August 12, 2019.